This MUST-HAVE, 232 page treasure is jam packed with hundreds of classic and never before published photos. 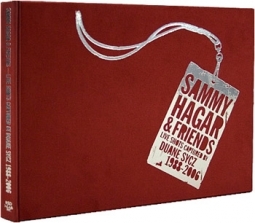 The definitive hardcover coffee table photo book of Van Halen! From 1978 to 1984, legendary rock photographer Neil Zlozower was the "fifth member of Van Halen," touring, partying with, and capturing images of the band during the David Lee Roth era, a time when the band was at the height of its powers. His photos capture the all-out, spandexed, high-kicking, high energy, blazing glory and backstage antics of the band as they became legends, and helped solidify their image as the ultimate rock and roll party band. With a forward by David Lee Roth and supplemental quotes and testimony from some of rocks biggest icons (Jimmy Page, Billy Gibbons, Gene Simmons, Joe Satriani, Steve Vai, Alice Cooper, Motley Crue, along with band insiders such as original manager Marshall Berle, producer Ted Templeman, Pete Angelus, Eddie Anderson, Dean Kramer, and many more), A Visual History is more than just a coffee-table conversation piece: it's an all-access pass into Van Halen's inner circle. 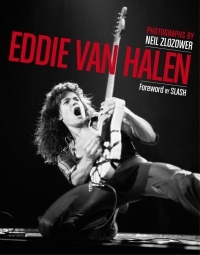 Zlozower's photographs - which include onstage and backstage shots, studio setups, candids, and portraits - are living, breathing documentation of Van Halen's greatest glories. Page after page, you smell the sweat and leather, you feel the heat of the stage lights, you hear the laughter, and you feel the high. And for the gearheads out there, we counted no fewer than 30 different guitars, most of them custom-made by Eddie out of spare necks and parts. 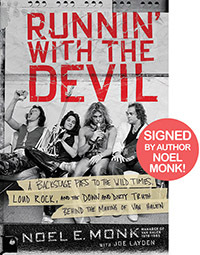 This too-good-to-be-true item is a MUST HAVE for Van Halen and hard-rock fans alike! As part of Van Halen's entourage, "Zloz", toured America with Van Halen, becoming their primary photographer. He was their friend who had the intimate access to the band that no one else had. Whether on the stage of a football stadium, poolside at a Holiday Inn or at Dave's dad's house, Neil and his camera were there and in everyone's face. He is also one of rock's most notorious and prolific photographers. His work has appeared in countless magazines and album covers. When you consider that Neil's prints sell for several hundred dollars each, it's pretty amazing that you can now own approximately 260 pictures from his prized collection at less than 10¢ each! Out of print & limited supply! This book is unbelievably good. Besides the pics, the countless quotes from musicians are very enjoyable. Must have for VH fans, and rock fans in general. I was so glad to see many of the classic photos I had seen over the years from magazines such as Hit Parader, Creem, Circus, etc in 1 book by the original photographer. Excellent collection and history of the band in full color!. I only wish there was a volume 2 or that I could order prints or posters of particular photos. Any VH fan knows Neil's work. This book is simply a must have for any fan of the original incarnation of the band. Classic and never before seen shots. I got the signed edition and it's perfect on my coffee table! Classic lineup and classic photos. Some you know and some never before seen. Zlozower is famous for his hard rock and metal photos. Here he captures VH through alll of their era and tours from 78-84. A must have for any VH collector. If you're obsessive like me, you'll get multiple copies so you can display and frame some of the photos.